Summer has surprised me once again, by vanishing so quickly, I can’t believe how the time flies. I finished my training at The Sarum Studio for the time being, but have booked in to return in February to paint for 5 weeks. The aim this summer was to finish what I refer to as the “never-ending-renovation” of my house, and I have become a renovating hermit, traditionally lime plastering, wallpapering, putting up coving, sanding floors and decorating etc, as well as working on commissions in between. Needless to say that after 9 years, I still haven’t finished, and have had to scale back my rather optimistic finish date due to the 13 commissions currently on order, and 2 more on the horizon. My father always used to say ‘work hard, play hard’ however he just worked – 80 or 90 hours a week. I do a fair bit of both. I find that the busier life is, the faster time seems to pass, and the years zoom past at an unnerving rate. It is rare that I take time out just to chill out and relax, saying that, many of the renovating tasks, in a similar way to creating artwork feel like a meditation in one way or another. As too many people have seen over the years, the house is a horrible chaotic building site. Still, it is starting to look good, progress is a very satisfying thing and it was great to be able to move out of sleeping in the lounge recently. As I type this, I look forward to completing the lime washing of the hallways tomorrow and move the ladders which everyone has had to squeeze past all summer. People ask what I will do when it is finished? I have it all planned – I am looking forward to dedicate more of my time to art, long walks, having friends round for coffee, yoga, reading books, watching films, I can’t wait for that to happen – next year….. 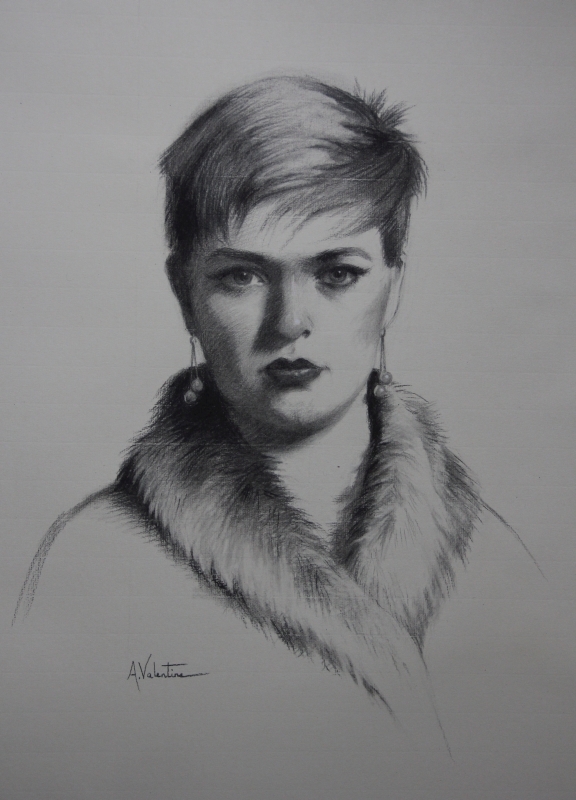 Here is a charcoal of one of the models at The Sarum Studio. The Old Masters training has been going well, I have graduated from working on cast drawings, and moved over to ‘the other side’ to work on live portraits. I have been greatly enthused by the Sargent exhibition in London, and recent visits to the National Portrait gallery, Tate Britain, the National Gallery and the unbelievable Wallace Collection which also hosted the Reynolds exhibition. Reynolds and Sargent both used the ‘sight size’ method for portraiture which I am learning, and it worked well for them! The feeling of staring intensely at someone’s face, especially when they are looking straight at you is something that feels deeply uncomfortable at first. Like the life drawing though, it is amazing how quickly the model turns into a puzzle of shapes, angles and tones to be explored and translated onto the paper. The model pictured here was so lovely, I was teased by the group for making her look quite demonic after the first afternoons work… I always feel just a little vulnerable when models see my work in progress, which they invariably do with this technique. My teacher kept advising me to tweak her eyebrows up, to give the dramatic look which she emanates so well. I never knew quite how important the positioning of eyebrows can be for conveying expression and each portrait I have done has surprisingly benefited by raising them just a little. I have demonstrated painting in public at the Harmony festival at the beautiful Larmer Tree Gardens, and also on my home territory in Blandford at the Crown Hotel for the Sudan Link charity event last weekend. This was quite busy and it was great seeing many of my friends who turned up. There will be an Open Studio Evening where I train by Salisbury Cathedral on Saturday 20th June from 3.30pm. Enjoy croquet on the lawn, Pimms and nibbles as well as an exhibition of drawing and paintings, and an illustrated lecture on Sight-size Portraiture by Nicholas Beer, with dinner after. Nick would like to know approximate numbers so please call him on 07793 135 963 if you are interested in attending. The website www.sarumstudio.com has more details. There are places available on his summer school, which is open to all abilities, I highly recommend that anyone interested should contact him. Life drawing is not something I have done much of in the past, even though it has happened at the gallery on a regular basis. So it was with much trepidation that I signed up to the Old Masters course, which is half life drawing/painting, and half portrait work. We set up every morning and work on the same pose usually for one or two weeks. I say the same, however I have been surprised at how little attention is paid to whether the model gets back into the exact previous position. It seems that my tutor Nick uses this approach in order to teach us how to deal with it. There are various techniques that we use, and although I was totally stumped initially when the image in front of me seemed to bear little resemblance to what I had just drawn, this is something I am gradually starting to get used to – there is much talk of finding ‘the gesture’ or feel of the pose. Although the lighting is excellent and well controlled, the shadows still tend to move around a lot throughout each session. Photos don’t have a habit of moving, which is why I have found them so much easier to work from in the past, but I am finding the life drawing both challenging and enjoyable in equal measures. My knowledge of anatomy is starting to improve too. 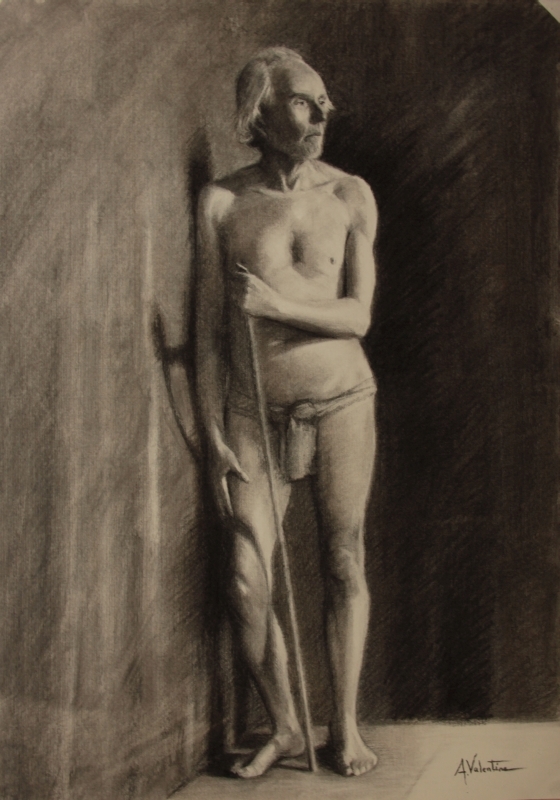 The image here has been done on Ingres paper with Nitrile charcoal sharpened to a point. It looks a bit fluffy and grey because of the paper. I have since progressed to using his preferred Roma paper, the charcoal goes on really dark on Roma making for more dramatic images, I am glad the poses are long as it is £11 a sheet! The model showed considerable professionalism during the pose as the Wren Hall is huge and not the warmest, especially when there was frost most days, and even several inches of snow one morning. Oh and the heating broke down, brrrrr. Here is a photo of the life drawing. I drew the loin cloth in afterwards to protect his modesty in the gallery window, it was that or a fig leaf!! 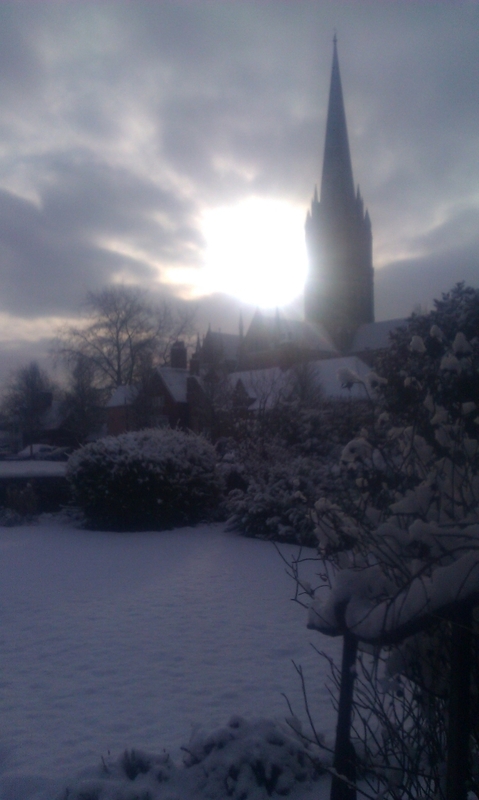 Below is a photo of one of the snowy days we had taken last month from the steps of Wren Hall where I study. I’ll add some more on Faceebook later including some strange spiky ice. I’ve never seen anything like it! If you would like to emailed when I post a new blog entry, follow the link to my email subscription form! To like or share this blog, click on an social media icon of your choice below, thanks for your support, Annabelle. The end of week six at the Old Masters training, following our half term the week before – a much needed rest from pretty much everything. I have ramped up my hours working on commissions for customers at the Wren Hall too. I do this before and after my training each day. Starting artwork before 8am was initially quite traumatic for this night-owl, but I am starting to get used to it now, and enjoying working high up in the building, with old leaded windows overlooking the stunning Salisbury Cathedral. The tutor Nick is trying to get the heating working up there, but I don’t mind working in the near Arctic conditions – the room has it’s own climate much like my home! The odd hot drink to hold when my hands start to go numb works wonders. I booked a tour of the cathedral tower with a friend from the course, if anyone ever gets the chance to do this, I highly recommend it. Apart from the almost unbelievable facts about how it was built during the medieval times, the views from the spire are just incredible. The building seems a lot higher once you get up there. Around 80,000 tons of materials were used, and apart from the spire, it was built in just 38 years! The medieval transport could only carry 1 ton per trip…. After climbing many many steps, the inside of the spire was a seemingly higgledy piggledy tangle of huge pieces of wood, and very tall indeed. It has also been a week of new orders – I have 3 more confirmed and there are a lots which will unfold over the next few months, a few photo-shoots need an outdoor backdrop when the weather improves and spring is here. I am planning more sleep this week, and to get on top of my paperwork, I blink and seem to have another 5 tasks to get through. The ‘things to do’ lists are quite long but I am on it! Surprisingly considering that February is my least favourite month, and the urge to hibernate is quite strong. Sitting at home typing this with the wood-burner gorgeous warmth I am thankful for being cosy. 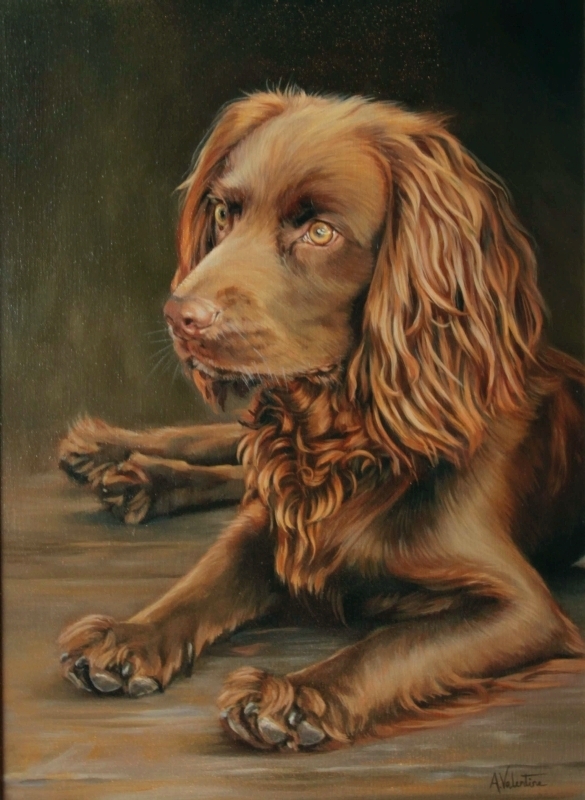 And no art blog is complete without an image of my work, so here is an oil painting of a very cute dog, 12″ x 16″. The photo-shoot happened in the gallery, and it was such a hot day last summer. The requirement was for his mouth to be closed, however, with the sun streaming in my huge windows, and the dog having just come back from a walk, he flopped on the floor and spent nearly the entire time panting with his tongue hanging out. I luckily captured the split second when he was looking just right. You can see him and more animal portraits including a newly added image of Canford Cliffs being ridden by top jockey Richard Hughes on the gallery page. A new year, a new website and the start of a new road to some long-held goals. Hello and welcome to the first blog post on my new website. My lovely partner, Vlad, has built me a new website – his first without using a ‘build your own’ type. There is a lot to do to make it the all singing all dancing website we dream of, but it is well on its way. 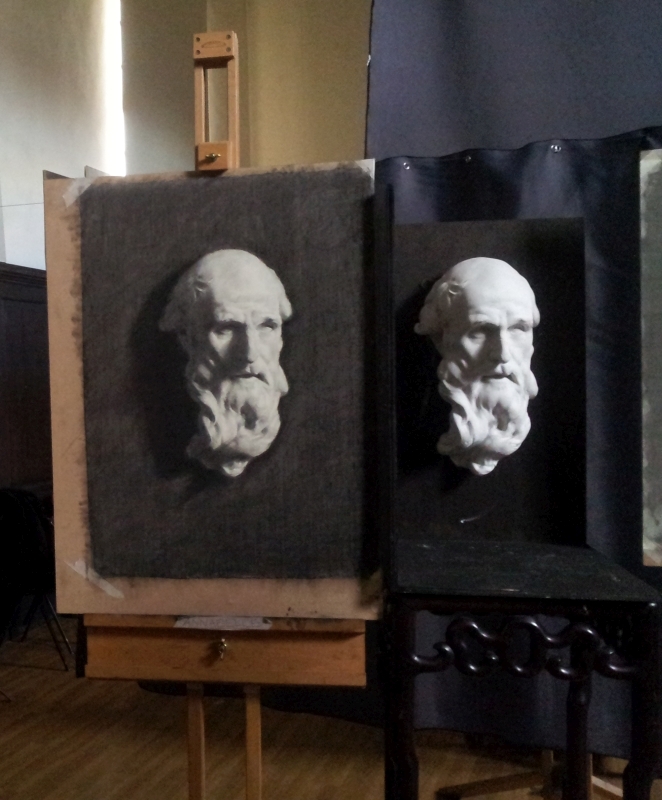 On the 5th January I started full-time study at the Sarum Studio. The tutor, Nicolas Beer, was senior instructor and artist-in residence at the famous Charles H. Cecil Studios in Florence for 20 years. He teaches the sight-size method employed by artists such as John Singer Sargent, Philip de László, Sir Thomas Lawrence and Henry Raeburn. I had the opportunity to train at one of the studios in Florence a few years ago but decided to buy the gallery instead. Now the training has come to Salisbury, in a building overlooking the beautiful cathedral. I plan to study full-time for the first two terms this year, giving me the second half of the year to concentrate on my other plans. I will do the same in 2016 as well. I will keep you up to date with my progress with this blog which will include lots more photographs! 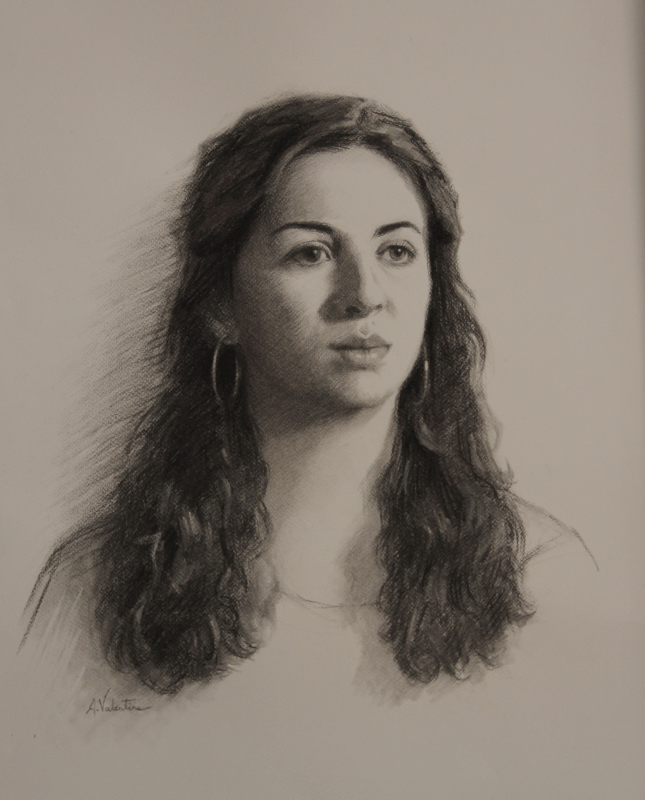 Below is a charcoal drawing from a cast. Just a work in progress, the complete image will be posted soon. Fiona Stolze and James Meiklejohn have both challenged me to post 3 images of my work each day for five days on Facebook. This will start on Monday, so make sure you keep an eye on my Facebook page. If you would like to be kept up to date with news and events or be notified of new blog posts, follow the link to our email subscription form! News and Events mails are intended to be infrequent. I will try and group events together rather than mail you every time an event is created or something interesting happens. Blog notification emails will be more frequent, being sent as often as once a week. Alternatively you can follow me on Facebook, Google+ and Twitter instead to kept informed as things happen. Thank you for your support, Annabelle. © 2019 Annabelle Valentine and The Valentine Gallery.